Financial advisors will often tell us of the steady increases available only through the stock market and present us with beautiful charts showing the relentless march of the the stockmarket ever higher and to the right. But what about inflation? How does the stock market perform when inflation is taken into consideration? After we take the loss of purchasing power into account have all the gains disappeared? 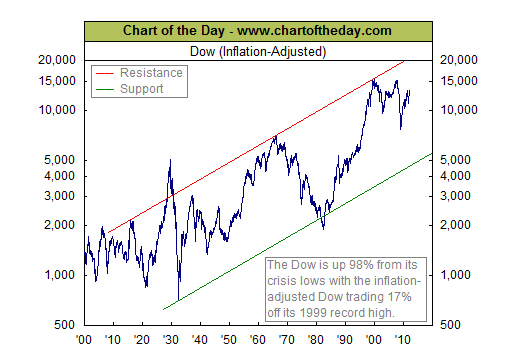 For some long-term perspective, today’s chart illustrates the Dow adjusted for inflation since 1925. There are several points of interest. For one, when adjusted for inflation, the bear market that concluded in the early 1980s was almost as severe as the one that concluded in the early 1930s. Also, the inflation-adjusted Dow is up 159% since its 1929 peak and trades 84% above its 1966 peak — not that spectacular of a performance considering the time frames involved. It is also interesting to note that the Dow is up 98% from its March 9, 2009 low which is actually slightly more than what the inflation-adjusted Dow gained from its 1966 peak to today. Notes: Where’s the Dow headed? The answer may surprise you. Find out right now with the exclusive & Barron’s recommended charts of Chart of the Day Plus.